The five works in this collection are among the very few texts that provide information about the now-extinct language of the Timucua, a Native American people who once lived in a large area of northern Florida, southern Georgia, and southern Alabama. The first two works, printed in Mexico City in 1612 and bound together into one volume, are catechisms in Spanish and Timucua written by Francisco Pareja, a missionary in Spanish Florida. 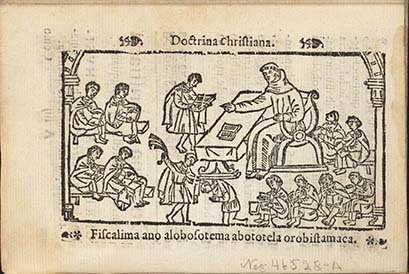 The third work is a Confessionario, also by Pareja, printed in Mexico City in 1613. The two other works are devotional texts compiled and tranlated into Timucua by Gregorio de Movilla, printed in Mexico City in 1635, and bound in one volume. Founded in 1804, the New-York Historical Society (N-YHS) houses New York’s oldest museum and an internationally-renowned research library, and is dedicated to increasing worldwide understanding of American history through exhibitions, public programs, online outreach, and research that reveal the dynamism of history and its influence on the world today. Holdings cover four centuries and comprise one of the world’s greatest collections of historical artifacts, art, and materials documenting American and New York history. These collections provide the foundation for exploration of the nation’s richly layered past, and support N-YHS’s mission to offer a forum for debate and examination of issues surrounding the making and meaning of history. For more information, please visit our website: www.nyhistory.org.